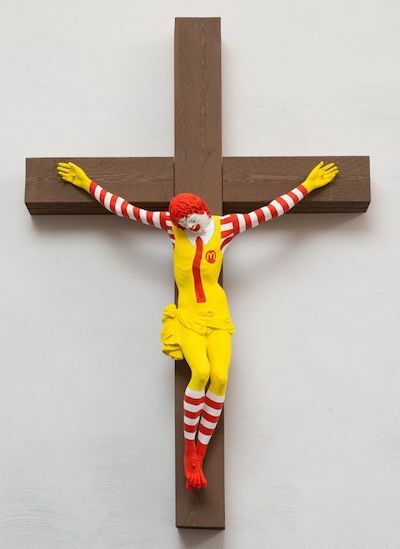 'McJesus', a sculpture depicting the crucifixion of Ronald McDonald, has been removed from an exhibition at a modern art gallery in Israel. The sculpture, by Jani Leinonen, was first exhibited in 2015, and had been on show at the Haifa Museum of Art since 4th August 2018. Last week, the gallery was firebombed, and police fired tear gas at hundreds of demonstrators who accused the artist of blasphemy. The exhibition, Sacred Goods, is due to close on 17th February. Jake and Dinos Chapman caused controversy with a similar sculpture in 2012. Their 'Unholy McTrinity', which also featured a crucified Ronald McDonald, was shown at the Hermitage in Russia.